As American television continues to garner considerable esteem, rivalling the seventh art in its “cinematic” aesthetics and the complexity of its narratives, one aspect of its development has been relatively unexamined. While film has long acknowledged its tendency to adapt, an ability that contributed to its status as narrative art (capable of translating canonical texts onto the screen), television adaptations have seemingly been relegated to the miniseries or classic serial. From remakes and reboots to transmedia storytelling, loose adaptations or adaptations which last but a single episode, the recycling of pre-existing narrative is a practice that is just as common in television as in film, and this text seeks to rectify that oversight, examining series from “M*A*S*H” to “Game of Thrones”, “Pride and Prejudice to Castle”. 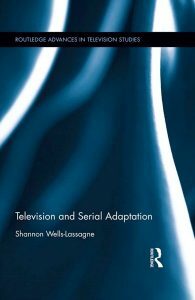 See https://www.routledge.com/Television-and-Serial-Adaptation/Wells-Lassagne/p/book/9781138696358 where about 20 pages of the book can be read.